Following hard on the heels of the recent sale of his central agency, Trinity's 53.95m superyacht Katharine, news arrives that Mark Elliott at International Yacht Collection has listed Northcoast's 40.2m motor yacht Life's Finest II for sale. Built in 1995 to a Jack Sarin design and previously known as Countach and Aquasition, this superyacht's Pokela Design interior sleeps 10 guests in a master, three doubles and a twin and has all the extras you'd expect including, of course, an on-deck Jacuzzi. 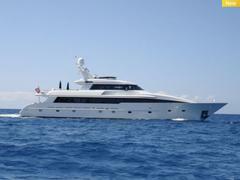 Located in St Maarten, her asking price is $7.75 million.